Endocrine, which arise from the islets of Langerhans. Most affected dogs do not have abnormalities on physical examination, and early clinical signs related to the disease can be sporadic and vague. Hypoglycemic episodes are often precipitated by exercise or fasting (increased glucose utilization) as well as by the ingestion of food (stimulation of insulin release). Intravenous or oral administration of glucose alleviates clinical signs. If prolonged seizure activity occurs, cerebral laminar necrosis can ensue. A complete work-up, including careful patient history, physical examination, bloodwork, and diagnostic imaging tests, should be performed to rule out other causes of hypoglycemia, such as sepsis, hepatic failure, adrenal cortical insufficiency, toxin ingestion, and other forms of neoplasia. A simple fasting blood glucose level of less than 40 mg/dL can suggest hyperinsulinemia, although careful monitoring of a fasted dog with suspected insulinoma is strongly recommended due to high risk for seizure activity. Additional blood analysis evaluating the amended insulin-to-glucose ratio (AIGR) may be warranted. This assay capitalizes on the lack of response to physiologic negative feedback inhibitory loops that decrease insulin secretion in the face of hypoglycemia in dogs with an insulinoma. Nevertheless, an elevated AIGR is neither sensitive nor specific for the diagnosis of insulinoma. The AIGR can be elevated from insulin-producing tumors other than insulinoma or normal in dogs with insulinoma. This test can be performed on serum samples and submitted to most large commercial laboratories. hypoglycemia. However, this assay is not specific and should never be considered a confirmatory test. 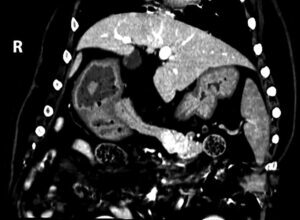 Thoracic radiography and abdominal ultrasound are recommended to assess for the presence of a possible pancreatic mass and associated metastatic disease (eg, lymph nodes, liver, lungs). 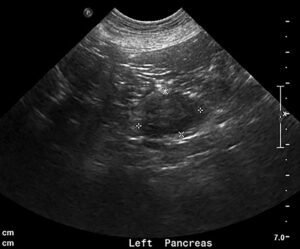 Although abdominal ultrasound is considered a relatively insensitive and nonspecific assessment for insulinoma, it is recommended to rule out other causes of hypoglycemia. In addition, some insulinomas are large enough to be detected on ultrasound (Figure 1). FIGURE 1. Ultrasound image of mass lesion within the left wing of the pancreas. Approximately 50% of insulinomas are not visualized by this technique. FIGURE 2. Arterial phase dorsal oblique computed tomography (CT) reconstruction (soft tissue algorithm) of a pancreatic mass (arrow). CT angiography is a more sensitive imaging modality for insulinoma. Some insulinomas are challenging to localize even on advanced imaging, and a lack of definitive identification of the tumor on preoperative imaging should not discredit a working diagnosis of insulinoma. In some instances, an exploratory laparotomy may be recommended when there is a strong clinical suspicion for insulinoma in the absence of visible disease. Allows complete staging via biopsy of regional lymph nodes and liver to determine the extent of suspected metastatic disease. Most insulinomas are solitary masses that can be detected intraoperatively with gentle palpation of the pancreas. Intraoperative ultrasound with IV 1% methylene blue has been used for additional visualization of the pancreatic lesion but is of questionable value. Partial pancreatectomy is the preferred procedure, with pancreatitis as a possible postoperative complication. Other complications include ongoing hypoglycemia, diabetes mellitus causing hyperglycemia, and neurologic complications from historic neuroglycopenia. Those with persistent hyperglycemia after surgery should be treated as diabetic until they are no longer insulin dependent. Stage III: Insulinoma with distant metastasis. Reported insulinoma survival times are listed in the Table. That have persistent hypoglycemia after surgery. The goal of dietary management is to maintain appropriate blood glucose levels throughout the day and avoid foods that may incite a spike in insulin release. This is achieved by feeding multiple small meals throughout the day and using foods that are high in protein, fat, and complex carbohydrates. Diazoxide is used in the medical management of hypoglycemia to inhibit the intracellular release of ionized calcium, thereby preventing the exocytosis release of insulin by the beta cells. It also contributes to hyperglycemia through its ability to stimulate the release of epinephrine. Diazoxide is commonly instituted in patients that do not respond to dietary management and prednisone. The dose of diazoxide for dogs with insulinoma and refractory hypoglycemia has been reported to be 5 to 10 mg/kg PO Q 12 H.1,7 The ideal dose for a clinical patient can be determined on the basis of successful management of clinical signs. The veterinary oncology literature has reported on streptozotocin as the adjuvant therapy for recurrent or metastatic insulinoma. Streptozotocin is an alkylating agent that is structurally similar to glucose and is selectively taken up by the GLUT2 transporter. This transporter is found in high levels on pancreatic beta cells, causing cytotoxicity. Streptozotocin can be given to dogs at a dosage of 500 mg/m2 every 2 to 3 weeks. Due to an elevated risk for renal tubular necrosis, saline diureses for 7 hours (3 hours before administering the drug and 2 hours after discontinuation of the drug) is recommended. Recently, there has been interest in evaluating the efficacy of tyrosine kinase inhibitors, such as toceranib phosphate (Palladia, pfizer.com), for dogs with insulinoma. This interest is based on studies evaluating sunitinib, a human multitargeted tyrosine kinase inhibitor, which has proven efficacy in phase II trials of humans with pancreatic neuroendocrine tumors.13,14 Anecdotally, we have experienced antitumor activity with toceranib phosphate in dogs with insulinomas in the measurable disease setting. Toceranib phosphate is well tolerated at a dose of 2.75 mg/kg PO Q 48 H. The most common adverse effects are gastrointestinal (diarrhea, decreased appetite, nausea), with myelosuppression and proteinuria15 being less common but well-documented adverse effects. Insulinoma is an uncommon malignant neoplasia in dogs that can result in significant illness, seizures, and death. Patients often present with clinical signs attributable to hypoglycemia. Diagnostics should include baseline bloodwork and imaging tests to rule out other causes of hypoglycemia. Thoracic radiography and abdominal ultrasound are recommended but are frequently unrewarding. Dual-phase CT angiography may be the best imaging study to diagnose insulinoma. Surgery is recommended and provides the best reported survival times. Medical management with dietary change, prednisone, diazoxide, and octreotide is possible. Streptozotocin is a reasonable adjuvant chemotherapy for patients with metastatic or recurrent insulinoma but is nephrotoxic, causes diabetes mellitus in some patients, and should be used with caution. Toceranib phosphate has not been formally studied in dogs with insulinoma but, on the basis of data in human studies, it may be an effective and well-tolerated treatment option. Goutal CM, Brugmann BL, Ryan KA. Insulinoma in dogs: A review. JAAHA 2012; 48:151-163. Polton GA, White RN, Brearley MJ, Eastwood JM. Improved survival in a retrospective cohort of 28 dogs with insulinoma. J Sm Anim Prac 2007; 48(3):151-156. Trifonidou MA, Kirpensteijn J, Robben JH. A retrospective evaluation of 51 dogs with insulinoma. Vet Q 1998; 20(1):S114-S115. Elie MS, Zerbe CA. Insulinoma in dogs, cats and ferrets. Comp Cont Edu Pract Vet 1995; 17(1):51-59. Robben JH, Pollak YW, Kirpensteijn J, et al. Comparison of ultrasonography, computed tomography, and single-photon emission computed tomography for the detection and localization of canine insulinoma. J Vet Intern Med 2005; 19:15-22. Mai W, Caceres AV. Dual-phase computed tomographic angiography in three dogs with pancreatic insulinoma. Vet Rad US 2008; 49(2):141-148. Tobin RL, Nelson RW, Lucroy MD, et al. Outcome of surgical versus medical treatment of dogs with beta cell neoplasia: 39 cases (1990-1997). JAVMA 1999; 215(2):226-230. Fischer JR, Smith SA, Harkin KR. Glucagon constant-rate infusion: A novel strategy for the management of hyperinsulinemic-hypoglycemic crisis in the dog. JAAHA 2000; 36(1):27-32. Simpson KW, Stepien RL, Elwood CM, et al. Evaluation of the long-acting somatostatin analogue ocretotide in the management of insulinoma in three dogs. J Sm Anim Prac 1995; 36:161-165. Robben JH, Visser-Wisselaar HA, Rutterman GR, et al. In vitro and in vivo detection of functional somatostatin receptors in canine insulinomas. J Nuc Med 1997; 38(7):1036-1042. Moore AS, Nelson RW, Henry CJ, et al. Streptozocin for treatment of pancreatic islet cell tumors in dogs: 17 cases (1989-1999). JAVMA 2002; 221(6):811-818. Northrup NC, Rassnick KM, Gieger TL, et al. Prospective evaluation of biweekly streptozotocin in 19 dogs with insulinoma. J Vet Intern Med 2013; 27(3):483-490. Fjallskog MLH, Lejonklou MH, Oberg KE, et al. Expression of molecular targets for tyrosine kinase receptor antagonists in malignant endocrine pancreatic tumors. Clin Canc Res 2003; 9:1469-1473. Papaetis GS, Syrigos KN. Sunitinib: A multitargeted receptor tyrosine kinase inhibitor in the era of molecular cancer therapies. BioDrugs 2009; 23(6):377-389. Tjostheim SS, Stepien RL, Markovic LE, et al. Effects of toceranib phosphate on systolic blood pressure and proteinuria in dogs. J Vet Intern Med 2016 [epub ahead of print]. Dunn JK, Bostock DE, Herrtage ME, et al. Insulin-secreting tumours of the canine pancreas: Clinical and pathological features of 11 cases. J Sm Anim Prac 1993; 34:325-331. Eliza Reiss Grant, DVM, is a medical oncology resident at Tufts Cummings School of Veterinary Medicine. She received her veterinary degree from Tufts University and completed an internship at Angell Animal Medicine Center. Her interests include canine lymphoma and tumor genomics. Kristine E. Burgess, DVM, Diplomate ACVIM (Oncology), is an assistant professor in oncology at Tufts University Cummings School of Veterinary Medicine. She received her veterinary degree from Tufts University, and completed an internship at VCA West Los Angeles Animal Hospital and residency in oncology at University of Wisconsin—Madison. Dr. Burgess’ interests include comparative oncology with a special interest in canine lymphoma.